Spring has almost sprung in Canada! We are all looking forward to an end of the snow and cold, as well as to an early Easter this year. If you are looking for ways to banish the winter blahs and decorate your home to welcome spring or Easter, don't forget to add fresh flowers to your decorating plans! Beautiful fresh flowers, bouquets and centerpieces are one of the best ways to brighten any home or table. Their impact cannot be underestimated, and with the low prices you find at Bloomex, you can reproduce even high-end designer looks easily and affordably. Check out these beautiful decorating ideas to freshen your home for spring! Order your favourite spring flowers or bouquet and follow the tips to re-create the look for yourself. 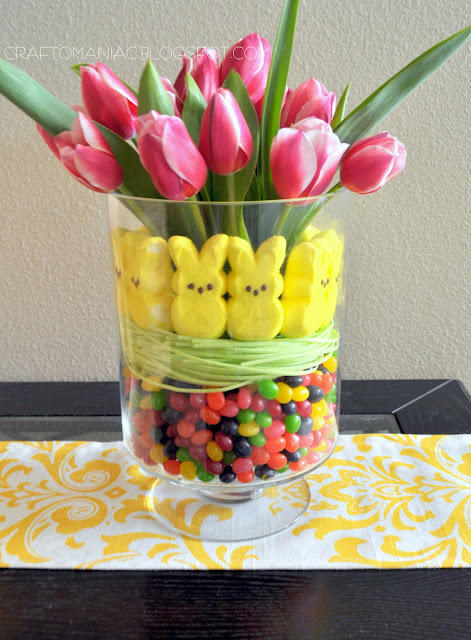 Create this lovely centrepiece (above) quicky and easily using a clear glass vase (there are many great choices at most dollar or craft stores) and some sweet treats such as marshmallow bunnies and jelly beans. Fill with beautiful tulips to add a pop of spring colour that will dress your Easter table and banish any winter blues. Find Tulip Bouquets in spring colours at Bloomex, starting at just $24.99! Choose a fresh floral basket to add instant spring cheer to any space! Bloomex has many blooming planter baskets that are an easy way to brighten your own home, or your lucky recipient's, for spring. 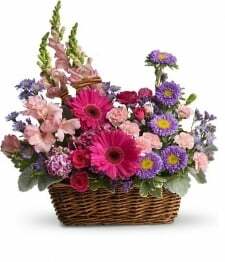 Shown above, the Pink Beauty Basket is full of bright colours that are sure to please. Try also a Joy of Flowers basket, or a Smiling Floral Basket for other springtime fresh choices, or see all the Bloomex Planter Baskets to select yours today. 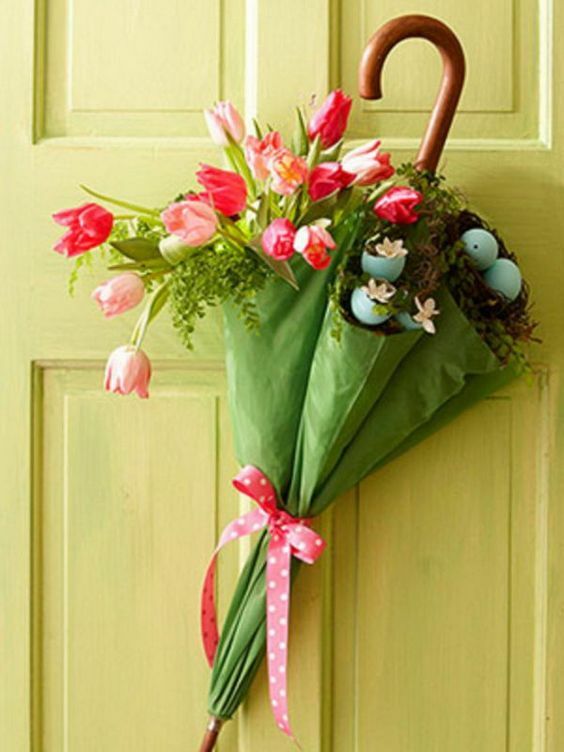 An adorable way to dress your front door for a spring celebration! Hang a colourful umbrella and decorate with some pretty ribbon. 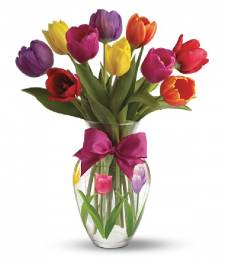 Fill with fresh spring flowers such as these tulips. This would be the perfect decoration for a baby shower. Choose from other pretty mixed bouquets at Bloomex to make this easy and fool proof! 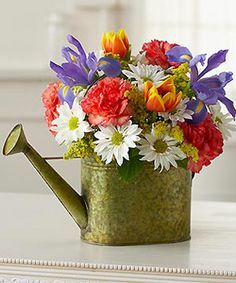 Another cute and simple idea: buy a watering can from the dollar or home store (most of local stores have lots of colours and varieties), choose your spring bouquet from Bloomex, and presto: instant spring chic! Try a Morning Bright Bouquet to add some cheer. 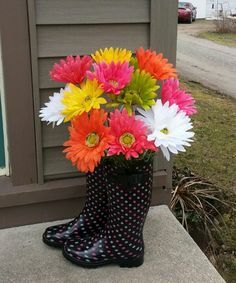 Get even more creative with your choice of flower container, and don't overlook the impact of a pair of cute rain boots. 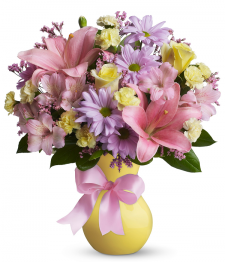 Dress your entry or foyer to welcome spring guests with a cheery bouquet. 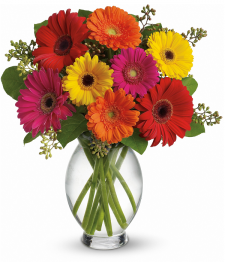 These assorted gerbera daisies are the perfect choice! 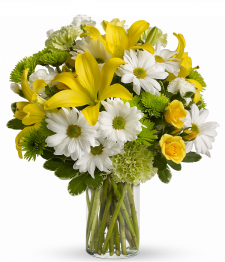 Check out the many Daisy bouquets at Bloomex. There are too many beautiful fresh spring bouquets and flowers at Bloomex to show you here, so be sure to check the website to browse them all. Have fun and HAPPY SPRING!